A SENSATIONAL JUMBLE OF MIXED BERRIES WITH SMOOTH CANADIAN VODKA. LIGHT, REFRESHING AND NOT TOO SWEET. BLENDED AGED RUMS AND FRESH LIGHT JUICES. ENJOY THIS 12 PACK ICE COLD OR FROZEN TO SLUSH! 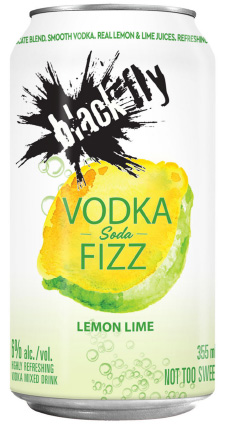 BLENDED WITH PURE LEMON AND LIME JUICES. Made with REAL PURE JUICES Vodka, Tequila, Rum, Whisky & Gin. More Natural, Less Sweet! Black Fly is available throughout Canada & the US. Find a store closest to your location! At Black Fly we understand that as we continue to grow, so will our Environmental Footprint. NETWORK show - FOOD FACTORY!